Intel Report on the Borgward BIVc, with 6 photos. "A BIV radio-controlled full-track, demolition vehicle of the type described in ETO Tech. Intell. Report No. 90, has been recovered and given a preliminary examination. Markings on the nomenclature plates of the hydraulic unit and charge release unit include the designation “BIVc”. 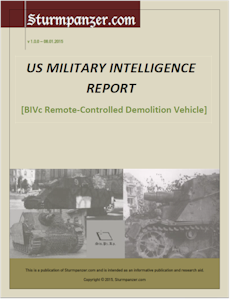 The vehicle is basically similar to the BIVb type reported in W.O. Technical Intelligence Summaries Nos. 129 and 130. The BIVc is slightly larger and has increased armor thickness. There is also a different arrangement of the engine and forward compartments."